Bakersfield moseyed into the trendy Mass Ave dining scene several months ago, setting up shop in the space formerly known as Bazbeaux. To be honest, I totally forgot this used to be Bazbeaux at all until I just typed that. That’s how different it looks now. I went there for a Saturday night dinner-and-drinks girls’ night out, and it proved to be a good choice. The shine definitely isn’t off the Bakersfield penny – the place was packed with a crowd that overflowed onto the sidewalk out front. 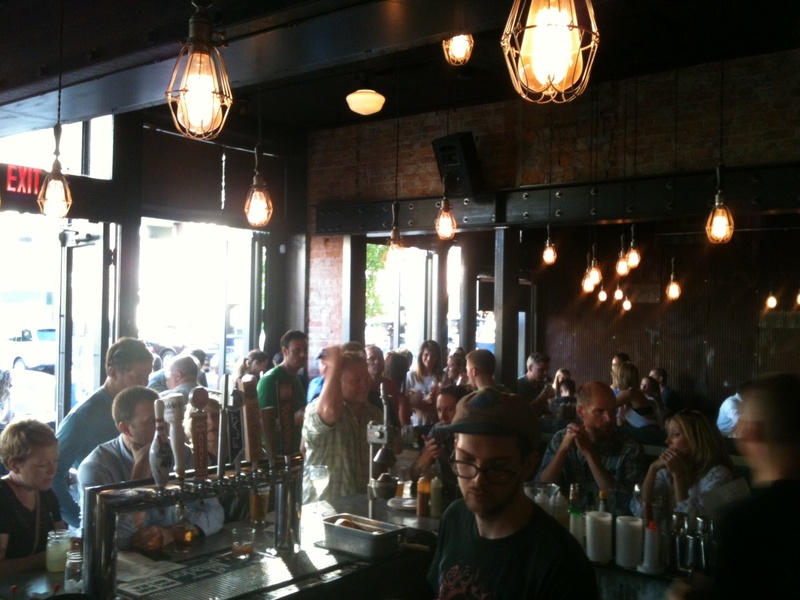 Three of my friends were already there when I arrived, holding down a set of bar stools in prime corner real estate. The décor is industrial-chic with brick walls, nifty caged hanging light fixtures and clever little nods to the rockabilly-ish “Bakersfield sound” musical era. Case in point, the women’s restroom is indicated by a picture of Loretta Lynn on the door. All in all, a young hipster’s see-and-be-seen sorta digs. So Bakersfield is part of a franchise with additional locations in Cincinnati, Columbus and elsewhere. 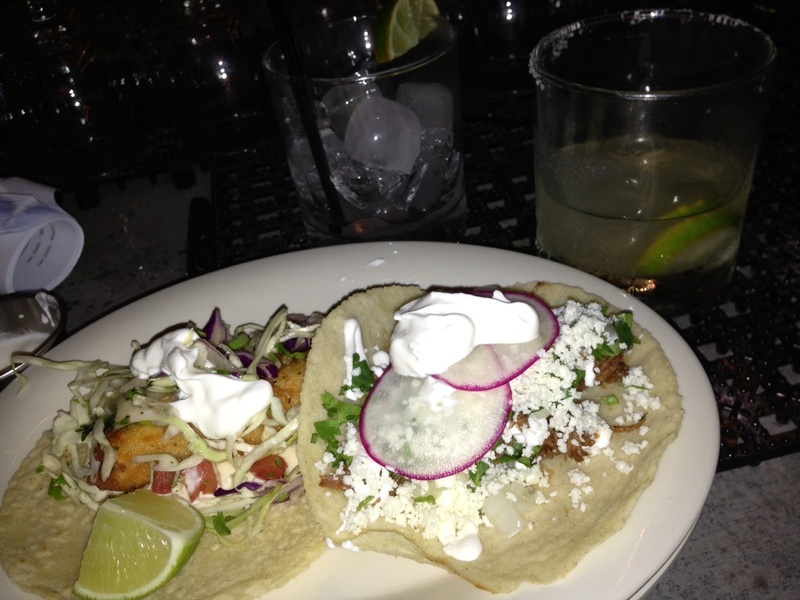 The claim to fame is Mexican street tacos and an eye-crossing list of tequilas, although the joint carries a perfectly respectable selection of bourbons and whiskeys as well. The girls were already well into a pitcher of margaritas by the time I got there, so I grabbed a glass and joined in before I’d gotten a good look at the drinks menu. Otherwise I might have sipped and sampled a bourbon or two, or ordered up a Chester Ave that sounds suspiciously like a Sazerac. Three of the signature craft cocktails feature Buffalo Trace bourbon. These are my kind of people. 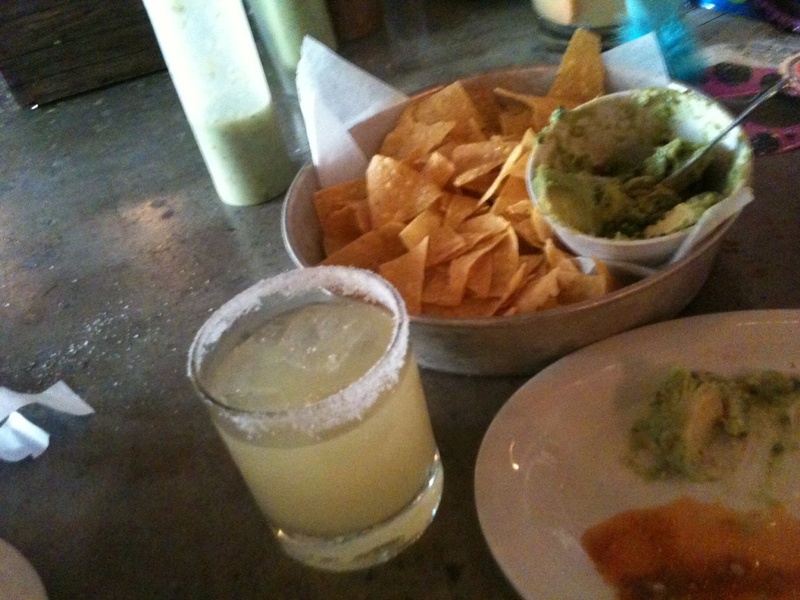 I don’t often drink margaritas, but when I do, this is just the way I like ‘em. Fresh, sweet and tart with lots of salt on the glass. The food menu’s not huge, but as our server said, they’d rather do a few things and do them well rather than offer a ton of stuff and do a half-assed job. Ok, maybe the half-assed part wasn’t his exact wording, but that’s what I imagined he said. Here’s what you’ve got to choose from – chips and salsa, chips and guacamole, chips and queso (get the idea?? ), a couple of salads, a couple of tortas and eight soft taco variations. The guacamole and tray of chips were enough for all four of us to share, and these were some darn good chips. Freshly made from white corn (and even gluten-free, which we discovered after the dietary-challenged member of our group made an inquiry). The guacamole was top-shelf, too, a very basic recipe with big chunks of fresh avocado, a little squeeze of citrus and a few pieces of radish (! ), an unusual addition, but a good one. Yummy stuff. We also gave the red and green squeeze bottles of salsa a good workout; I preferred the green. I think we managed to sample six different tacos. They’re small enough to order two or three per person (although we stuck to a dainty two each). The most fun tacos to say also seemed to be the tastiest — the cochinita pibil with kicky achiote braised pork, pickled onion and cilantro; and the huitlacoche, a vegetarian option with corn truffles, roasted poblano and cotija cheese. A little crema on top, a squirt of green salsa, and we were cooking on gas, baby. My chicken mole taco was also good, but not quite as good as the cochinita pibil. I hadn’t realized I’d ordered two braised meat tacos until they arrived. 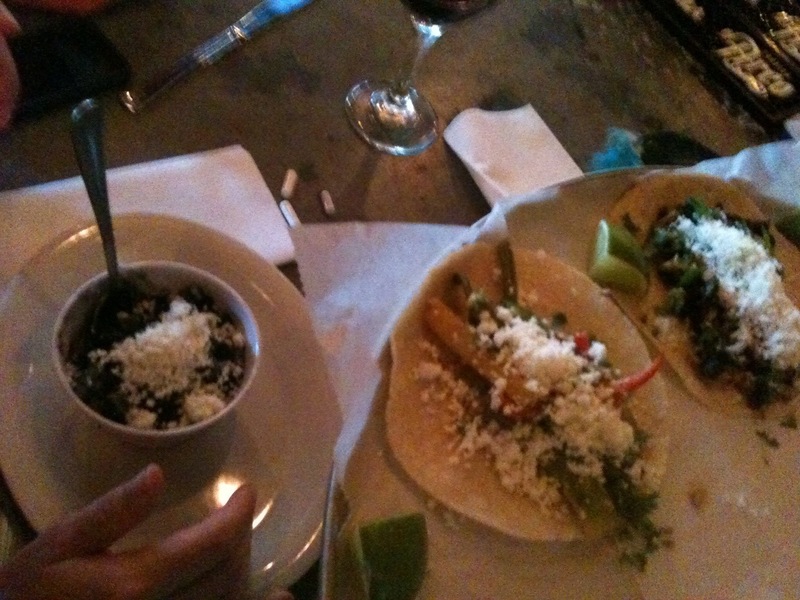 The mahi fish taco and the rajas (another veggie option) that my friends got both looked good, but I didn’t get the skinny on whether they liked ’em or not. Everything we ordered disappeared in short order, so I’m assuming they did. Best of all, each taco only costs $3 or $4, making Bakersfield surprisingly affordable for lunch or dinner. Even when you tack on some chips for a few more bucks and a drink or two, you can still get in and out of here for $15 to $20. A very refreshing surprise for a downtown night out.